I was very excited to make it to wine club last Thursday. Three WHOLE hours out of the house sans kids. Amazing. The theme for the evening was Chardonnay from around the world. We seem to be a group that likes to guess things about what we’re tasting and see who gets the most right. Sometimes that means we do a blind tasting, others we try to guess where the wine is from or how much it cost. This time we had the descriptions of all six chardonnays we tried, but we didn’t know which wine was which. I’ll be up front and admit that I got every last one wrong. Oops! But, I have some excuses. #1: I thought this wine was light, citrusy (like fresh-squeezed limes) with a bit of green apples. Very acidic and tart. This was my favorite one of the evening. I guessed this was the Bodega Catena and it was not. #2: I thought this wine smelled very oaky, however it tasted less oaky. It was pretty fruity and the oak was nicely balanced against the fruit. I liked it. I guessed this wine to be the William Fevre Chablis. Of course, it was not. #3: This wine smelled like a glass full of buttered popcorn. (Which is caused by diacetyl, a natural byproduct of fermentation). While there was some fruit flavor underneath, I found the wine way too oaky for my taste. I’m not one for oaked white wines, sometimes I just feel like I’m drinking a wood plank. I guessed this wine to be the Iron Horse. Wrong! #4: This wine was acidic and smelled of green apples. It was refreshing to drink and had just a touch of oak. It was my second favorite of the evening. I thought it might be the Carmody McKnight. Nope! #5: At this point in the night, my nose started to fail me, because my notes for the nose are “??”. I also noted that it tasted pretty oaky. Very descriptive, I know. I thought it was the Trevor Jones. Of course, I was wrong. #6: This wine was an interesting experience for us. Immediately upon pouring it one thing was very obvious, it was oxidized. The color was like apple juice. As you might imagine, it smelled all kinds of horrible. We all tasted it to see what an oxidized wine tastes like. Let’s just say most of us needed a chaser (I chose bread smothered with goat cheese). I guessed Talley Vineyards for this one. So, part of what made it so difficult to place the wines (and I did change my mind several times), was having one of them be oxidized since it clearly didn’t taste like the description. I also failed to notice that wine #2 was in a bottle that was a screw cap. Had I paid attention I almost certainly would’ve pegged it as the Australian wine and certainly wouldn’t have chosen France. I mean, c’mon, a French wine with a screw cap?! So two very unfortunate things happened this week. On Tuesday it was 107 degrees outside. This is an unreasonable temperature, especially when you live in a home without air conditioning AND the weather this summer had blessed us with the 5 weeks immediately proceeding this heat burst where the temperature rarely exceed 78. On Monday, when the temperature merely brushed up against 100 degrees, we decided we should open the Blason Pinot Grigio to help cool off. Which brings us to the second unfortunate thing, though it happened first. The first sign that things might not be great was the bright yellow synthetic cork I pulled out of the bottle. I hate to admit it, but yes, I am biased against wines corked with synthetic materials, especially brightly colored synthetic materials. I just haven’t ever had a wine sealed that way that blew my socks off. (Please don’t confuse this with screw caps, however. I’ve had many a delicious wine sealed with a crew cap). The wine was super pale yellow and actually smelled pretty good. It was fresh and light with a faint lemon scent. But, then I tasted it. Its not like it was God-awful, it tasted of minerals and hay or straw with a light taste. But, the finish was funky, and just tasted cheap. I did drink my initial 1/2 glass while making dinner, but when I poured the second half after the kids were in bed and took my first few sips I realized I wasn’t enjoying the wine at all. I turned to Myles and announced that I didn’t want anymore. Not from that glass or the bottle. Wine has calories and these just aren’t worth it. And while he finished the remainder in my glass, he didn’t want anymore from the bottle either. Before going to bed I unceremoniously poured the rest of the bottle down the drain. I can’t help wonder, did K&L steer me wrong by stocking this wine? I don’t know enough to know whether or not the wine was “correct” according to typicity and place standards, so maybe it was fine, just not my thing. Who knows?! K&L describes it as being “sensational” and “extraordinarily drinkable for the price”, being really good in the price-to-quality ratio, and that its a lot better than most other pinot grigios that cost less than $10. All I do know is that we didn’t like it. I should’ve spent a bit more $$ and gotten this one from a producer often mentioned in my wine books, or this one that received a good score. Perhaps they’re better examples of the grape in this region. It was really hard to choose my next region to taste. I’ve just begun so almost everything is left, and I can’t wait to try just about everything! Since it's summer (albeit a mild one. A glorious, glorious mild one), I decided I should stick with somewhere known for its white wines. One of the most sipped white wines in warm weather may be Pinot Grigio, so I decided on Italy. Friuli-Venezia Giulia [free-oo-lee ve-ne-tsyah joo-lyah] to be exact. Though this region didn’t occupy much space on my to-do list, I found a good selection of enticing offerings at K&L and decided to expand my two wines to try (Pinot Grigio and Tocai Friulano) to five. As Myles put it, I’m a sucker for marketing. In my defense, the other wines are all made from indigenous grapes or are otherwise rare. The diversity of new experiences available from Friuli was too attractive. Besides, its not like K&L knows I’m going region by region and targeted me. Right? Friuli is the very northeastern “ear” of Italy and part of the Tre Venezie (the others are Tentino-Alto Adige and the Veneto) because of the historical relationship the three regions share to the Republic of Venice. 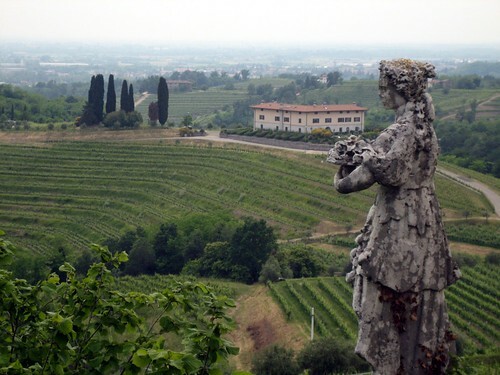 With a bit of nostalgia, I can remember the very first vineyards I ever saw in person (likely the Veneto) back in 1997 when I was (NERD ALERT) touring Europe with a band and choir. We did a day trip from Austria to Venice and I remember being just entranced by the rolling vineyards to be seen along much of the drive. I also recall a very grumpy Italian woman yelling at us at a rest stop in violent Italian. Undoubtedly we group of American teenagers did something wrong- I still don’t know what! Friuli is best known for its white wines, although almost 50% of their wines are red. It's also prosciutto country where both prosciutto di San Daniele and prosciutto di Parma are made. White wines are what makes this region famous, and especially endearing to me since when the rest of the world began to focus on oaking their wines, apparently here in Italy they were focused on acidic, unoaked whites. I’m particularly looking forward to trying the Toaci (toe-ki, rhymes with hi) Friulano, after reading how hard it is to describe! Being such a small region, you’ll notice that the five wines hail from just two wineries. And, with the exception of the Picolit, are very inexpensive. Yay for Italian wine bargains! I read somewhere recently, and I can’t remember where it was, that many serious wine-o’s don’t think Sauternes has reached maturity (and thus is ready to drink) until it ages to the amber color of honey. Well, I don’t have that kind of time (or money). This golden yellow wine is already 6 years old! The nose was very rich, you could tell it was a sweet wine. It smelled like honey, caramel, ripe peaches and what I would expect white raisins to smell like-- if they had a strong scent. 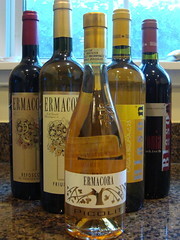 As with most higher alcohol, sweet wines, it was very full-bodied. I thought it had a bit of an oily viscosity to it. Honey was the strongest part of the nose, and it too was the strongest part of the taste. I also picked up apricots (which is pretty typical of Sauternes) as well as toffee. When I was re-reading some of the Sauternes sections of my books, I think it was The Wine Bible where the author said, can you taste the botrytis? In other words, does wine made from moldy grapes taste like moldy wine? Well, the answer is no (and they don’t “wash off" the “fuzz” before making the wine), although she said experienced tasters can tell. It was hard not to think about it when I was drinking, trying to taste the botrytis. I can’t say for sure, but I did find a hint of raisin flavor. Kind of like the flavor you taste when you eat a fresh table grape that has just begun to go soft and raisinate. Was I tasting the botrytis or fooling myself? Overall, the wine was good. But, I guess someday I’ll need to taste an aged, amber colored Sauternes to really experience Sauternes. Almost immediately upon beginning my wine education reading, I learned about noble rot. I started flipping through 1001 Wines You Must Taste Before You Die and found myself looking at a page about a wine from Spain, the Corona Reserva Blanco Semi Dulce. Noticing the vintage date on the wine was 1939, I read the description more closely. (Best read the description, I thought, since I’m clearly never going to have a bottle of wine from 1939 in my hand). In a bit of a history lesson, I learned that in 1939 the Spanish Civil War came to an end, though in Rioja things were so chaotic that the harvest was severely delayed. 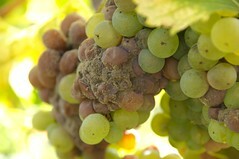 Thus the grapes used in this wine were “likely affected by botrytis”. Having no clue what that could possibly mean, I consulted my Oxford Companion to Wine . How this works is that the mold causes the escape of the water inside the grape (the mold needs the water to germinate its spores), leaving the sugar, acid and flavor more concentrated. Moldy, raisinated grapes result. In order to end up with these grapes the conditions have to be just right for the fungus to grow (location near water for moisture, cool nights and warm days), and grapes, or berries, are often picked one by rotten one from September and sometimes into November. What little juice remains in the grapes is then extracted and fermented into this apparently delicious, and sweet, wine. Sauternes, which is wine made in the Bordeaux region of France (and can come from one of five communes, though Sauterenes and Barsac are the most well known), usually from Semillion, is probably the most famous wine made from botrytis afflicted grapes. So, a week or so after learning about this most noble of molds, when I found a small bottle for $19.99 at Whole Foods, I bought it. Never mind that I still had two months of pregnancy left at that time. I picked up the 2004 Le Dauphin de Guiraud, from Chateau Guiraud. This appears to be the second label wine from Chateau Guiraud (the first of which does appear in the 1001 Wines book), so it seems a good place to start. So, next up is this "nectar" of a wine. The last wine of Alsace, the Roland Schmitt "Glintzberg" Gewürztraminer. Second to the Riesling, I was really looking forward to this one because unlike the other three wines, which were new to me, I’ve had and enjoyed several other Gewürztraminers. On our last trip to wine country we brought home two different ones for our collection. An off-dry version from Kunde and a dry, and quite yummy one, from Gundlach Bundschu. Having only had American versions of the grape, I was looking forward to the European take. The wine was a very pale yellow, more so than I would’ve expected for what I knew was going to be a powerful wine. And sure enough, the nose was quite powerful. It smelled really good- like pineapple, sweet floral, honey and the super sweet nectarines we’ve been getting the last few weeks in our fruit delivery. As I had expected, the wine was very strong (in a good way! ), full-bodied and a bit sweeter than I thought it would have been. According the the winery website its a “dryer style”, but I thought there had to be some residual sugar. I can’t find any info on whether or not that’s the case. I also tasted honey and mango with some floral undertones, maybe the strength of that flavor was fooling me into believing the wine was sweet. I also tasted stones- less like minerals and more like straight up stones. I did think it was a bit hot on the finish, but I’m not experienced enough to know if that was because it truly was a bit unbalanced or because at 14%, this wine had quite a bit more alcohol than what we’ve been drinking lately. Besides being a good accompaniment to spicy foods (unfortunately Evan’s feeding schedule didn’t allow me to try along with dinner), Gewürztraminer is also said to have strong aromas and flavors of lychee. I read that all the time, but I’ve never actually tried lychee. I need to hunt some down so that I know if this is the case. The new frozen yogurt place in town has lychee flavored yogurt. I’ll have to try it there, especially since Paulette in SF was out of lychee macaroons when we went by yesterday. We opened this wine, from Charles Baur, on one of those “I need a drink” days. After being sick, I was really looking forward to a nice glass of wine. And nice it was. I’m still not as in love as I was with the riesling, but this was a great, refreshing glass of wine. On the nose I smelled tropical fruit (again-- I’m starting to wonder if that’s all I’ll ever smell!). Though this wasn’t as overtly fruity as the Pinot Gris, it was more floral in nature. I thought maybe a touch of orange blossom. It smelled a bit sweet- but then again, tropical fruit is sweet! Like I said, it was refreshing to drink. The kind of wine that you can practically gulp down without noticing how fast its disappearing. It had more obvious acidity than the lost couple wines, most notable on the start and finish. It had a fairly light body, which I think is required for a wine that goes down almost like water! It didn’t taste sweet or of tropical fruit at all, much more like lemon and a bit tart, like white grapefruit. K&L, where this wine was a real steal at only $12.99, had quite a few notes. It mentioned the wine being like lemon meringue pie (which I can’t remember having, ever?!) and sweet citrus; an “easy-going” wine. Exactly what I mean when I say it goes down so easy. It’s described as being clean with a snappy finish- agreed, but also being rich (certainly not compared to the Pinot Gris!) and a fine alternative to Chardonnay. Then, they go on to say that is a bit un-Alsatian and tastes more like a white wine from the Loire Valley. I obviously haven’t tasted from that part of France yet- but if that’s the case, I look forward to it. Is it ok to buy wine at Target? To 'celebrate' Myles' birthday and Evan turning one month old last week, everyone in the family, except Myles, came down with a summer cold. Thus, tasting our next Alsatian wine has been put on hold until my schnoz is fully recovered. In the meantime, I thought I'd post a little musing I wrote up whilst still pregnant and intended to post waiting for Evan to arrive. Thankfully, he came soon enough I didn't get this up! I consider it part of my education to look at wine, wine labels and restaurant wine lists whenever I get a chance. I practice reading European labels (and remembering what might be inside!) and try to familiarize myself with winery names, appellations, varietals, prices, etc. A concurrent shopping trip slash pop quiz, if you will. One of the most recent places that I found myself perusing the wine aisle was at Target. For the most part, I’d written it all off before even walking down the aisle. There couldn’t possibly be any decent wine for sale at Target. Then, as I scanned the shelves, I noticed a bottle of Louis Jadot Beaujolais-Villages. Hmmm... wasn’t that one of the examples of Beaujolais mentioned in one of my books? I know I recognize the name Louis Jadot, a commonly seen shipper of French Burgundy wines here in the U.S. Beaujolais (from 100% gamay grapes) is on my list of wines I want to try, although I have specifically marked down I’d like to try a Cru (rather than Neauvou or Villages). I’m intrigued by this red wine that is to be served cold (55 degrees). As I stood in the Target aisle, bottle of wine in hand, I was tempted. Ultimately, I went home empty-handed (well, without any wine, it’s Target-- no one can go home empty-handed), because I didn’t know the answer to this question: is it ok to buy wine at the same place I get my toilet paper and laundry detergent? And while we all ponder this question, I want to add that I did pick up a Louis Jadot Beaujolais (the aforementioned red wine disappointment in the previous post), however I didn't ultimately purchase at Target, but Trader Joe's. Of course, once we had the bottle open I realized it wasn't even a "villages" wine, but just generic Beaujolais, lower on the totem pole than the wine I'd seen at Target! Hopefully that explains its disappointing-ness. We tried it cold first (in the rough ballpark of 55 degrees) and it was not really good at all. Letting it come to room temperature improved it enough to finish the bottle. I have decided not to officially post that I've tasted my Beaujolais, as I think there's more there than this particular wine offered. We'll return to it in the future-- at which time I will not purchase the wine at Target. Or Trader Joe's.